CANDLES MAKE A DIFFERENCE – PERFECT FOR FAMILY AND FRIENDS. ORDER A HAND PAINTED CANDLE FOR CHRISTMAS. $19.95 INCLUDES SHIPPING – (3×5 in size) SHARE THE LIGHT WITH A CANDLE. LIGHT A CANDLE AND GIVE LIGHT, THE GIFT OF LOVE. IT’S BETTER TO LIGHT WITH A CANDLE THAN HAVE IT SET IN THE DARK. SHARE YOUR LOVE WITH THE LIGHT OF A CANDLE. CLICK ON CONTACT OR TELEPHONE 505-419-2938. 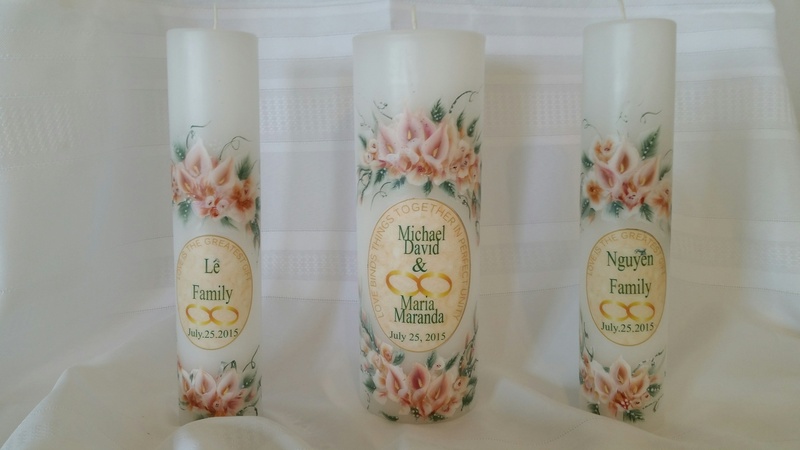 Add elegance to your wedding ceremony and keepsake with the hand painted decorated wedding candle and two family candles, for the altar and/or reception table, which includes the wedding pillar candle that is designed with large and small delicate flowers. 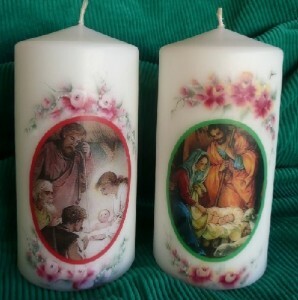 The matching lighting candles are also hand painted with flowers as well. 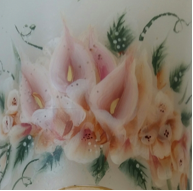 The large candle measure 3″ x 9″ high and side lighting candles measure 2” x 9″. Choose your preferences of color and flowers. PLEASE PLACE YOUR ORDER TWO MONTHS IN ADVANCE. Call 505-419-2938. 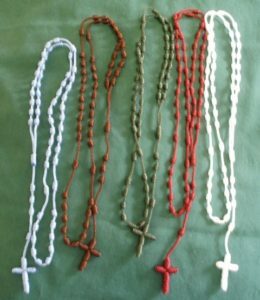 ROSARY CRAFT: The sisters are in the Rosary making again. Contact us to place an order or call 505-419-3300. 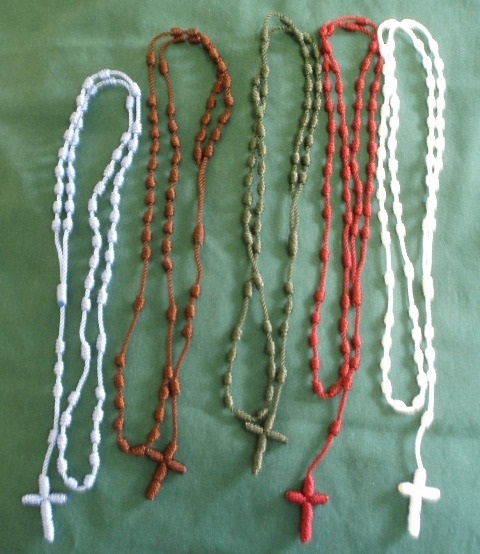 Cord Rosaries 19 Inches, come in various colors including BLACK, PURPLE, BLUE, BAIZE, OR PREFERRED COLOR. ONLY $7 + FREE SHIPPING. 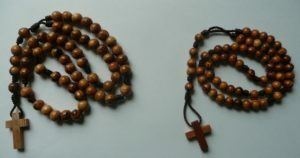 6 or 8 mm beads and Cross are made with olive wood from Jerusalem, scented with oil, ONLY $10 + FREE Shipping. We would be glad to take your order. You can contact us via the web or call 505-419-3300. 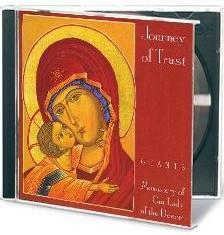 This CD of chants and hymns by the Benedictine nuns of the Monastery of Our Lady in the Desert includes ancient and modern selections. 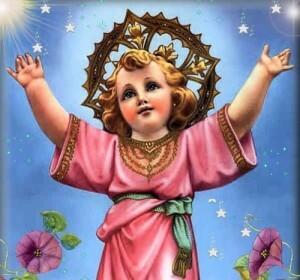 Their “Journey of Trust” began with a gift of 40 acres of land in Gobernador, NM, through the intercession of St. Joseph. 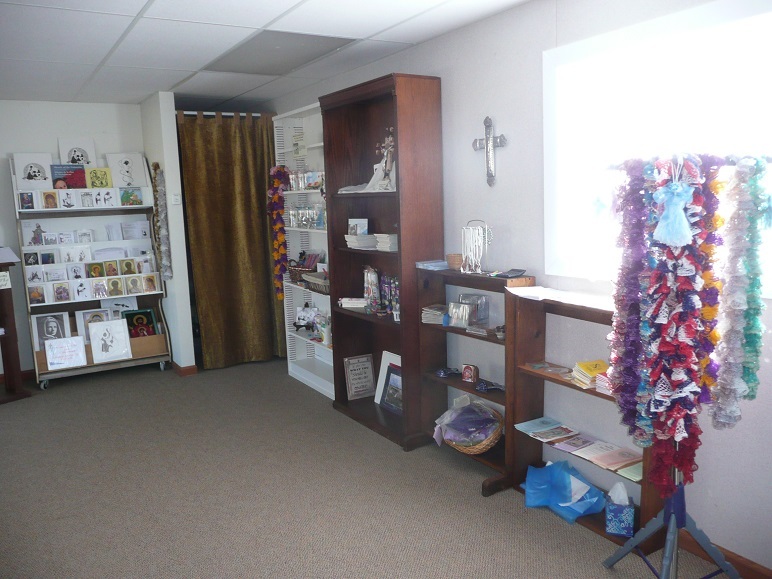 Now the St. Joseph Center is a facility for retreats and conferences, a place where all can come to join us for a time of silence, prayer, renewal, and spiritual refreshment. By purchasing the bookmarks shown above, you are supporting the mission of Santiago Atitlan, Guatemala, where Blessed Stanley Rother was martyred July 28, 1981. 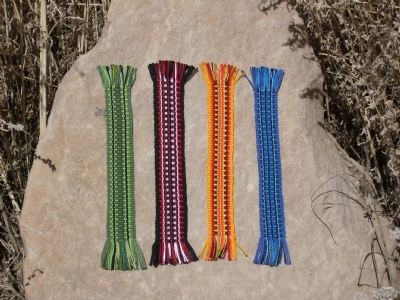 Made with cotton threads and hand woven. Size is generally from 8 1/4 x 1 inch. Comes with a plastic cover. CHOICES OF THOSE ABOVE INCLUDE: Grapes, Chalice, Cross, Church. 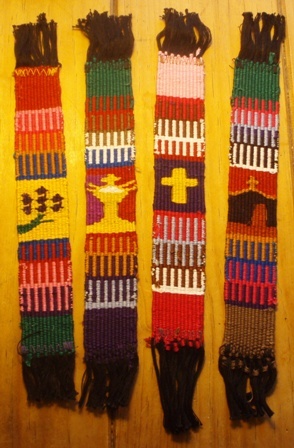 The bookmarks shown above are CHOSEN by color and handmade by a nun from our monastery. 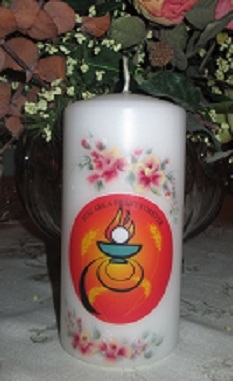 BAPTISM CANDLE $14.99 plus postage – These hand painted candles are white and come in the size of 2 x 9 inches. 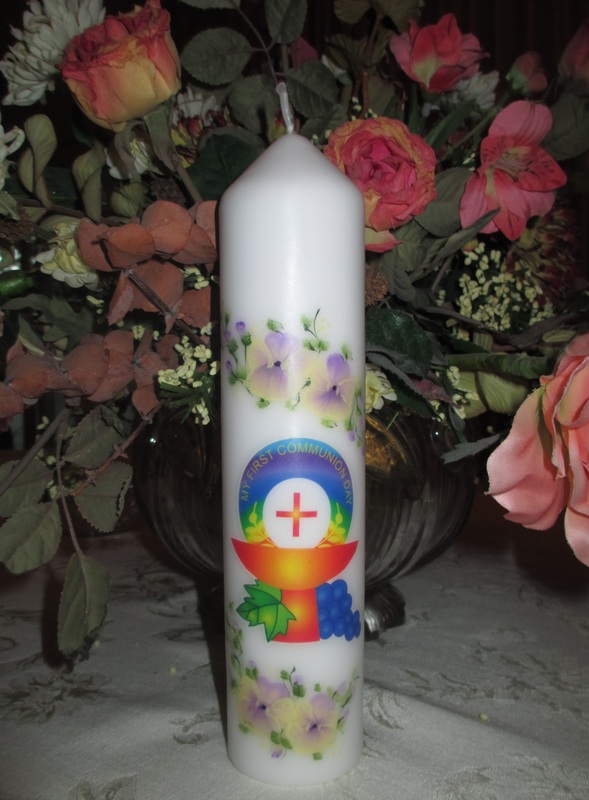 Simply decorated with pansies and daisies, they make a lovely religious remembrance of the sacrament of Baptism. On the candle are the words, “I baptize you in the name of the Father, Son and Holy Spirit,” with the added words, “Child of God.” CHOOSE FROM BLUE FOR BOY AND PINK FOR GIRL. We wrap each candle individually with cellophane and ribbon. 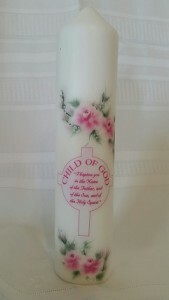 HOLY COMMUNION CANDLES $12 Plus postage, FREE shipping with $50 or more per order. Size 1 1/2 x 9 inches.